Home Awesome Products High Voltage “HELP!” is on the way! 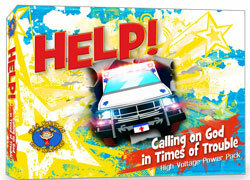 High Voltage “HELP!” is on the way! If you’ve ever used ANY High Voltage Resources, from my good pal Brian Dollar, then you know he has a passion for making teaching kids easy, fun and biblical! Brian is known for delivering great resources at amazingly affordable prices… perfect for small churches trying to provide a great kids church experience on a limited budget. And now, Brian has raised his already high bar even higher with his new release of HELP! Calling on God in Times of Trouble. Brian’s new line of curriculum comes with even more helpful tools… for not a dollar more. Maybe that’s why his name is Brian “Dollar” – he’s all about delivering value for your ministry! Want to download a sample lesson and see some sample videos? Order HELP! via Instant Download for $20 off automatically! *If you order and end up winning, we’ll make sure you win something else instead! Fall is Here! Get Yerself TRAINED! There are many times how God has helped me. One time, not too long ago, I have dealt with a feeling of failure in Ministry. I felt like whatever I was doing, did not have an impact. God helped me through it, by showing me, how everything we do for His Glory, has an impact. We might not see it now, but God sees it. WHOA! Check out these trucks!